It was around 4-5 years after I started to teach myself to draw from no background in art whatsoever, I could barely draw a stick man at that point and was one of the many people that would say “oh no, I can’t draw, I’m not talented at all”. Well, I’d still agree with my former self that I don’t have any natural in-bred talent – but I have learnt a skill through practice and determination. Art is now an inherent part of my life which I simply wouldn’t do without now. This blog will probably be read more by artists I guess, but if by chance you’re one of those people that says “oh no, I can’t draw, I’m not talented at all” – you absolutely CAN. I guarantee it, if I can do it then so can you, but only if you have (or develop) the desire to put in the hours and also accept that the failures are essential to learning. I churned out a year (at least) of horrible drawings, but I knew that I just had to ignore it and figure out where I could improve. If someone had told me when I started out that I’d be creating an art-based website in a few years time then I would’ve smiled politely and make my excuses whilst edging away from the nutter. No. Possible. Way. And yet, here I am – a year after setting up that website having made new online arty friends, received and given advice and probably committed myself to producing more artwork that if I’d carried on just producing the occasional drawing and posting it unseen into the cupboard. In fact I might not have ever started painting which is my most recent adventure. It would appear that back then I still lacked the confidence maybe, as I registered the domain and created the website but my first post wasn’t for a few weeks later. I can’t remember the reason now but I can imagine a large deal of procrastination holding up proceedings. That’s something else I’ve learnt to avoid when detected. 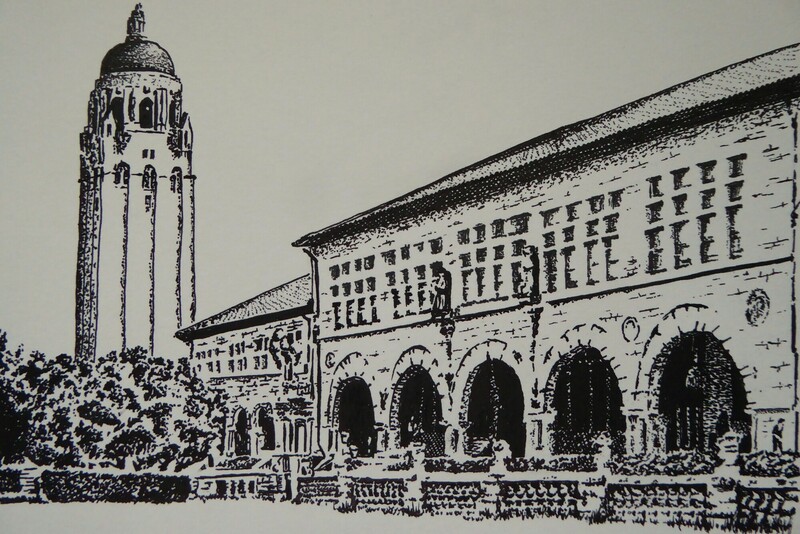 I’m still not clever enough to re-post blog entries but here’s the first picture I posted up below – Stanford University drawing in ink. Apparently there’s been 336 pictures posted since then which is fairly mind-blowing. Many of which would also include work-in-progress shots but even so that seems a lot to me. By far and away the busiest time was October – or as it came to be known to me Inktober. It’s the first time I’d taken on the challenge, and it was tough, but I’d recommend it to anyone – and I mean anyone. No special tools are needed, a Bic Biro and some sheets of blank paper. 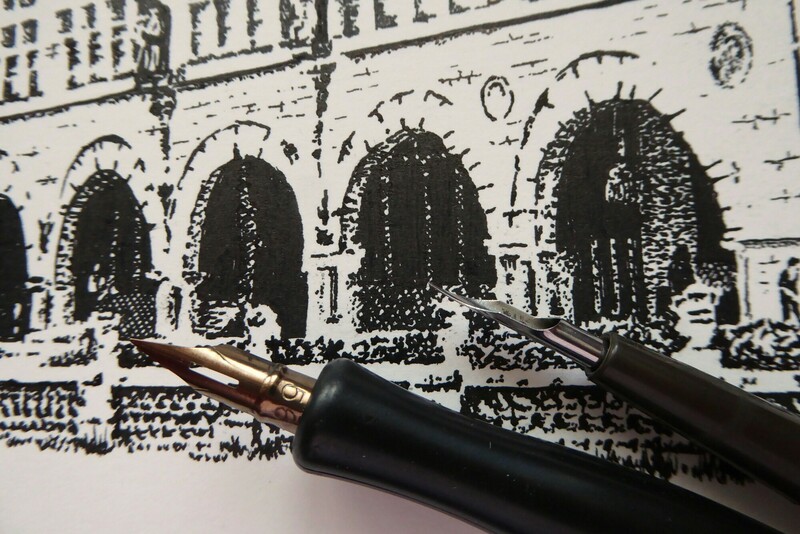 If you don’t currently draw then I’d encourage you to take out that biro and start making marks now, you’ve got seven months of practice time before you join me on Inktober this year – do it do it do it. Very many thanks to my followers and anyone that takes the time to look at my artwork, and especially to those who take the time to comment. Thank you for the peer pressure, thank you for the encouragement, you are a large driving force to carry on with it !! What can I say – congratulations 😀 Now that’s a great anniversary post! Happy anniversary! I’m so happy to have found you this year. I’m self taught at my art as well. Practice and determination. Learning to ‘see’ better. All vital in improving. And you’re definitely in possession innate talent, Steve! You’re very modest! Do you mind if I reblog this? I think it’s a function of the ‘sharing’ buttons. However, if you want to repost one of your own posts, all you need to do is change the date of the post and it will reappear in the reader. It doesn’t go out again through email however. Happy Anniversary! I enjoy reading your artistic adventures and you’ve almost tempted me to take on Inktober myself… almost! Yes, definitely do it please. Since I started drawing, I’ve also started following more artists both here and on other social media sites. One of my favorite finds has been Steve Kidd who’s also a self taught artist. He works in pencil and ink and recently began painting like me, though he’s doing watercolor and makes me look like a finger-painting toddler! Anyway, I’d love for you all to visit and follow Steve on his one year blogging anniversary! Congratulations, Steve! I never would have imagined that you’ve only been doing art for 5 years. Your work ethic is amazing! Congratulations on a year of blogging, and thanks for all your comments and peer pressure for my work as well! For whatever reason it still had a hold on me and I restarted the habit with new found determination to draw something, anything, every single day. And since then I have stuck with drawing nearly every day, and I have to admit (even to myself as my harshest critic) I can see progress. I think I realised it when I was throwing away less stuff, almost like I was striking it lucky more often but of course being analytical about it, it was just that I’d become more skilled. There’s no magic, no in-bred talent (blaming you Mum and Dad), nothing special about it – it’s just putting in the hours and I’m 100% convinced that anyone can do the same. I still consider myself at the start of the journey, looking forward to the next few decades of it but I know that I will never stop learning. * I just wanted to add to this comment; “didn’t feel I was progressing further” as I think it’s important for anyone in a similar position, this nearly stopped me entirely. I think it’s important to realise that when you start out in anything in life is when you make the biggest gains. If you expect to keep making that initial impressive progress then you’re not likely to do your morale any favours, if you do continue making impressive progress continually then pat yourself on the back because you’re obviously a special genius. It’s the concept of the “low hanging fruit”, that’s the easiest to attain, after that requires more effort. Accept that the curve isn’t linear up-front and you can save yourself the heartache, it won’t stop you cursing it though, just curse and carry on. – Show up – draw daily, if only for minutes. – Shut up – if there’s a little voice of perfectionism in your head, tell it “Shut Up” – feel free to adopt the voice of Stormzy if it helps, it’s only in your head. Accept failure for what it is, an opportunity to learn. – Listen and learn – there are billions of words of advice on the internet, learn which ones are useful (you will waste time and effort initially on those that aren’t useful), and when you find good advice practice with it in mind. One other hint here, the old ways are often the best, there is no magic bullet.